So excited that the harvesting of garlic will begin in around two weeks from now. We are currently making our second pass through with the task of weeding. We are taking orders for garlic braids now. You make a choice of what variety you would like your braid to be and we will make it. We will try to match your choice, however, there is always the possibility the garlic is just not suitable for braiding, so if you have a second choice, please add that to your order. 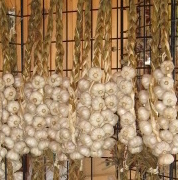 You can pick your order up at the Carp Garlic Festival on August 8 and 9th, at the Verona Garlic Festival on Sept 5th. Orders can also be pick up at any other event listed on the event page. Braids can be shipped out as well anywhere in Canada. Prices are based on the weight of the braid. Any other garlic orders such as seed and cooking will be taken only after September.